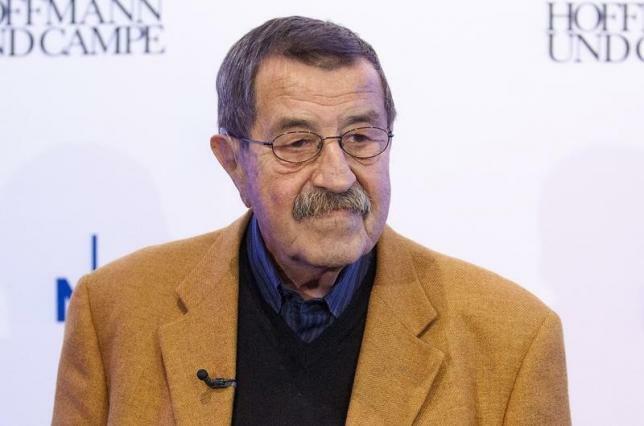 BERLIN – German novelist Guenter Grass, the Nobel Prize-winning author of “The Tin Drum”, an epic treatment of the Nazi era, died on Monday at the age of 87, his publishers said. A broad-shouldered man with a drooping moustache, Grass spurned the German tradition of keeping a cool intellectual distance, insisting that a writer’s duty was to be at the frontline of moral and political debate. For many, he was the voice of a German generation that came of age in World War Two and bore the burden of their parents’ guilt for the atrocities of the Nazis. The independent German Cultural Council called him “more than a writer … a seismograph for society” and the Anglo-Indian novelist Salman Rushdie called him “a true giant, inspiration, and friend”. However, Grass’s concealment until 2006 of the fact that he had served in a Nazi Waffen-SS regiment as a teenager cost him some of his moral authority. Although hailed as a literary innovator for his magical realist style, Grass was more likely to use public platforms to air his views on issues such as nuclear power and Germans’ historical responsibility than to discuss the craft of novel-writing. A seasoned left-wing campaigner, he was a towering figure in West Germans’ efforts to keep the door open to their Communist-ruled cousins in the east during the Cold War. Yet Grass opposed hasty reunification after the Berlin Wall fell in 1989, and hoped a new generation of German authors from the east would nourish their work on “western arrogance”. Grass was born in the Baltic port of Danzig, now Gdansk in Poland, in 1927 and much of his fiction was set in the city. “The Tin Drum” caused a sensation when it was published in 1959, though it was condemned by some as obscene. Former West German president Heinrich Luebke is said to have remarked that he would not sit at the same table with a man whose work he could not discuss with his wife in the privacy of their bedroom. The book is told through the eyes of Oskar Matzerath, a strange, gifted boy who resolves to stop growing just as Nazism emerges in the 1930s, and relentlessly pounds the drum of the title. It was made into an Oscar-winning film in 1979 by Volker Schloendorff. “Cat and Mouse” (1961) and “Dog Years” (1963) were also set in Danzig in the war years and after, while “Local Anaesthetic” examines opposition to the Vietnam war and the generation gap. Grass had a stormy relationship with the centre-left Social Democratic Party, criticising it when it joined a conservative-led government in the 1960s but campaigning for Willy Brandt, the party’s first post-war chancellor and champion of east-west detente, in the 1970s. SPD leader and deputy German chancellor Sigmar Gabriel said that, with Grass’s death, “we lose one of the most important writers of German post-war history and an engaged author and fighter for democracy and freedom”. Awarding him the Nobel Literature Prize in 1999, the Swedish Academy described one of his last works, a series of essays called “My Century” (1999), as showing “a particularly keen eye for stupefying enthusiasms”. Not even 12 when war broke out, Grass was forced like other youngsters to join paramilitary organisations, and entered the Hitler Youth at 14. Drafted into a Waffen-SS tank division in 1944, he experienced the full horrors of war when more than half his company of mostly 17-year-olds were ripped to pieces in three minutes of shelling. But the fact that he did not reveal this part of his history until 2006 brought accusations that he had been hypocritical when attacking others for failing properly to face up to Germany’s Nazi past. When Germany surrendered in 1945, Grass was briefly an American prisoner. He then worked on a farm, in a potash mine and as an apprentice stonemason before studying sculpture in Duesseldorf and West Berlin. He began writing poems and plays in the early 1950s, worked as a journalist, played in a jazz band, and illustrated some of his own books. In 2012, his poem branding Israel a threat to world peace earned him a ban on travelling to Israel, which Grass compared to his treatment by East Germany’s Stasi secret police. “Why do I say only now … that the nuclear power Israel endangers an already fragile world peace? Because that must be said which it may already be too late to say tomorrow,” he wrote in the poem, which was criticised by some in Germany as anti-Semitic.